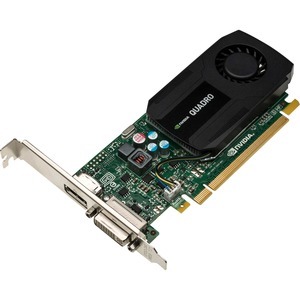 Harness power-efficient 3D application performance inside your HP Workstation with the NVIDIA® Quadro® K420 1 GB graphics card. It's an ideal solution for creating entry to medium complexity 3D models. Easily support your professional software application base with comprehensive ISV certifications. Enjoy fast performance from the power-efficient GPU and 2 GB of DDR3 memory. Get low-profile, single-slot 3D performance that fits within your most compact workstation chassis, and the entire HP Z Workstation lineup, and doesn't require external power. Get an all-new display engine that drives up to four displays with DisplayPort 1.2 support for ultra-high resolutions like 3840 x 2160 @ 60 Hz with 30-bit color. Then, easily manage them with NVIDIA® Mosaic and NVIDIA® nView® technologies.